CloudGuide at the Museum of America in Madrid! Created in 1941 by decree, the Museum of America aims to bring together collections of American archeology and ethnology to make them more attractive, understandable, known and admired by the public. Collaborating with CloudGuide, you can find, up to November 15th, on the museum’s profile a guide for the temporary exhibition "Trans. Diversity of identities and gender roles". The exhibition deals with transsexuality in an anthropological, historical and artistic perspective through works of painting, ethnography, archeology or contemporary photography selected by the museum itself. Do not waste a second and download our app and guide to find out everything about the genre, going far beyond "male" and "female"! Are you considering digitizing your institution? If so, then you've come to the right place! There are 2 concerns that we encounter nearly every time we meet with an institution considering digitization (namely mobile apps, multimedia guides, and interactive games). Today, we woud like to to share both of these concerns with you, as well as how we solve these problems and add good value to institutions like yours. Delivery: Content can be texts and videos, all the way to visitor-device delivery -- it's very important to know if the platform you are assessing is really the best fit for your institution. For example, if your institution has bad or spotty reception: a mobile app with an uncompressed, forced 300mb download is going to cause a lot of headache for your staff and visitors. However, a mobile application that compresses that 300mb of content down to 12mb and gives visitors the option of streaming or downloading it will make for a much better experience (shameless plug: CloudGuide does this). Content Management System (CMS): The next thing to consider is that your provider's CMS needs to be easy-to-use and responsive, with the ability for advanced users to take greater creative control. Whether it be texts, images, audios, or videos (or a combination of all 4) that you want to share with visitors, your CMS must offer intuitive controls that allow staff to easily manage all of your content easily. This is important because, if your institution is like most others, your staff are already loaded down, and the last thing that they need is to spend several hours fumbling through a wonky CMS while trying to set up your mobile application. With CloudGuide, an entire exhibition with texts, images, audios, videos, and games can be uploaded, configured and made public to your visitors in 1 hour. Retention: The average retention rate for a culture & heritage mobile application is about 17% after 3 days. That’s 5% less than the average for all mobile applications. You’re paying for a mobile application that visitors can use on-site, but your expectation is that visitors have a use for it off-site as well, after all, you’re not paying thousands of dollars for people to download your app and then delete it immediately after leaving...but, that’s what happens. By and large, this retention rate is due to your institution's application being completely worthless outside of your institution. Completely. Worthless. There's nothing in it that would be useful outside of your institution, yet you are spending thousands of dollars a year to offer it. Hours, ticketing (with ability to purchase), agenda/events calendar, donation, location, Facebook, Instagram, Twitter, newsletter and website links, directions, and even accessibility information. CloudGuide offers all of the above, in addition to your mobile app being listed alongside 400+ institutions spanning 13 countries. Visitors don’t just download and then delete your mobile app, they always have it on their device. When they want to buy tickets: they open it, check your institution hours + agenda/events, and then tap ‘Buy Tickets’. All right from your app. By the numbers: Our data shows that visitors spend 3x longer in our app than they do on your website -- if you give your visitors what they want it shows: you’ll have a mobile application with a retention rate that is 60%. That's 3.5x the industry average. Aprovechando la digitalización de los 16 museos estatales y otras instituciones culturales en España, CloudGuide presenta un proyecto para que la digitalización de las instituciones culturales y su contenido, se convierta también en la digitalización de los procesos de creación de estudios de audiencias de museos, monumentos y instituciones culturales. El proyecto no sólo pretende crear estudios de audiencia basados en el comportamiento de los visitantes dentro de cada institución a través de la aplicación, sino analizar y concluir pautas de comportamiento a nivel nacional de los visitantes de una institución cultural española (ya sean nacionales o internacionales). El objetivo del proyecto fundamental, pues, es proporcionar a las instituciones culturales (museos, monumentos y gobiernos especialmente) de una herramienta digital para conocer a sus visitantes de modo cuantitativo y cualitativo. Este proyecto, tiene el soporte del Ministerio de Educación, Cultura y Deporte gracias a las ayudas para la modernización e innovación de las industrias culturales y creativas mediante proyectos digitales y tecnológicos. CloudGuide Selected to Participate in the VC CultTech Hackathon in Vienna, Austria ! Last week, CloudGuide was invited to participate in the VC CultTech Hackathon in Vienna, where we spent three days creating solutions that will further impact the future of Arts and Culture. The VC CultTech Hackathon organized by the viennacontemporaryand Pioneers Discoveroffered a unique chance for cultural institutions to gain inspiration and innovative concepts from tech experts and startups from around the world. 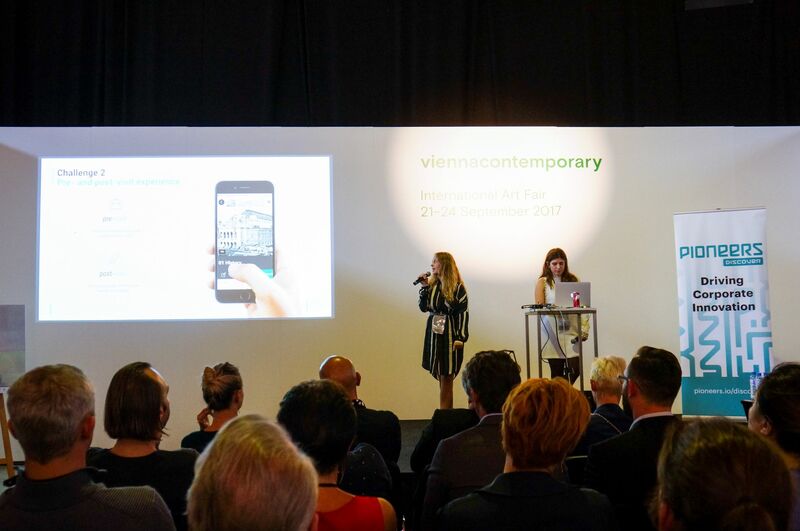 During which, 8 participating teams, and over 30 members, presented their solutions through the use of technology in order to come up with a way of shaping the future of arts in Vienna, Austria. In our case, CloudGuide spent three days rapidly prototyping a plan for Vienna State Opera, in the interest of coming up with designed solution to enhance the customer experience to fit the needs of the famous Vienna Opera House. Among the challenges we were requested to overcome, CloudGuide proposed a variety of ways that the Opera House could incorporate in their institution in order to digitalize the overall stay from beginning to end. Additionally, through the use of new technologies, we successfully proposed solutions so as to enhance the art experience and integration of innovative solutions towards community building. This was a great chance for members of our team to work and establish relationships with some of greatest Viennese art institutions, as well as contribute and share our solutions to members of the art and IT society. Museo Marítimo Ría de Bilbao has joined CloudGuide this Summer 2017! Discover the Museo Marítimo Ría de Bilbao and be ready to be taken on an exciting voyage by uncovering the key roles that the Estuary has played in the transformation of Bilbao and its surroundings. Appropriately located on the waterfront, this great museum serves as an important element of the city and region by helping to preserve and spread the history, culture and identity of the men and woman who have lived on and from the Bilbao Estuary, which is closely bound to maritime tradition. Using bright and clever displays to bring the watery depths of Bilbao and Basque maritime history to life, as well as including an outdoor section especially made for children and the young at heart who dream of boarding a range of boats and discovering their inner sailors and pirates. The aim of this museum is for the visitors to not only learn about the importance of the role of the Bilbao Estuary but for people visiting to simultaneousy have a good time by laughing, playing and having fun.